The famous south Indian breakfast rice idli recipe can be converted into a healthy and fasting (farali / vrat / upvas) recipe by making the idlis with barnyard millet and serve with coconut chutney. In India, cereal grains are not consumed during fasts which make varai a popular ingredient during the fasting days. The varai rice idli tastes almost similar to broken rice when cooked. It is tiny, white, round grain, bigger in size than semolina (rava) and smaller than sago (sabudana). The varai being readily available, quick to cook and good to taste and its ideal wholesome alternative to rice, wheat, and other less readily available millets. 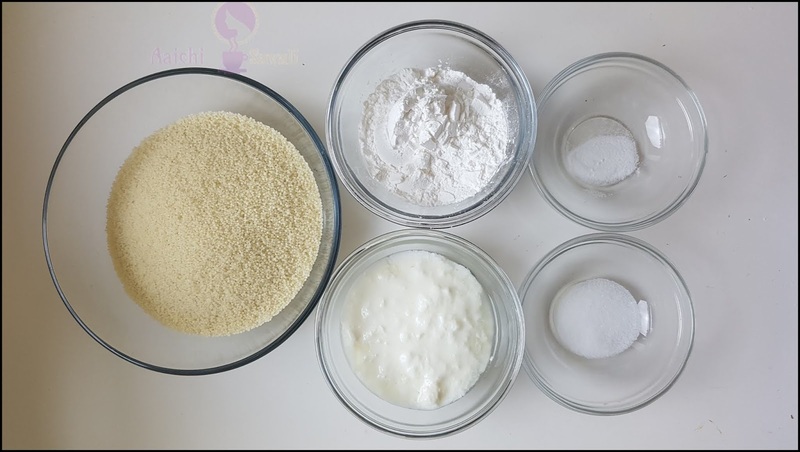 Blend varai to make a coarse powder and mix with sabudana flour. In a bowl combine varai and sabudana mixture with curd, salt and by adding water ¼ cup make an Idli batter. Keep the batter aside for 30 minutes for fermentation. Meanwhile, grease Idli mold with oil and after 30 minutes add baking soda to the batter and mix well. 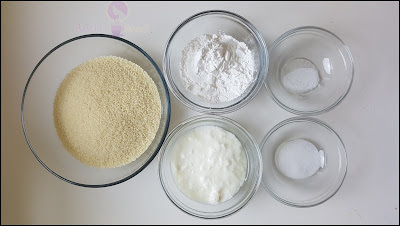 Now, pour prepared Idli batter into greased Idli mold. 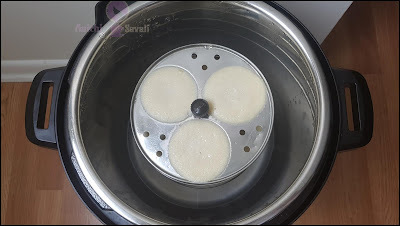 Add 1 cup of water into the instant pot and place the Idli stand into the pot. Close the lid and steam for 15 minutes using steam mode of the instant pot, NPR for 10 minutes and then release remaining pressure manually. Using spoon remove Idli from the Idli mold and serve hot. 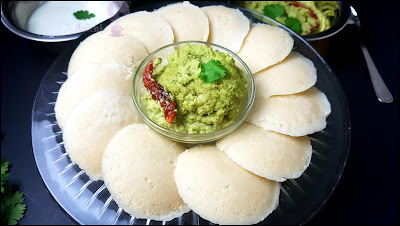 Tadaa, healthy and yummy Idli is ready to serve, serve hot with upvasachi chutney. Enjoy!!! Per serving contains 80 calories, along with carbohydrates - 16 g, dietary fibers - 1 g, fats - 0.16 g, proteins - 2 g.
Excellent source of Fiber: The high fiber content helps in preventing constipation, excess gas, bloating and cramping. It is a good source of protein and at the same time is the least caloric dense compared to all other cereals. Gluten-free: It is an appropriate food for patients who are intolerant to gluten. 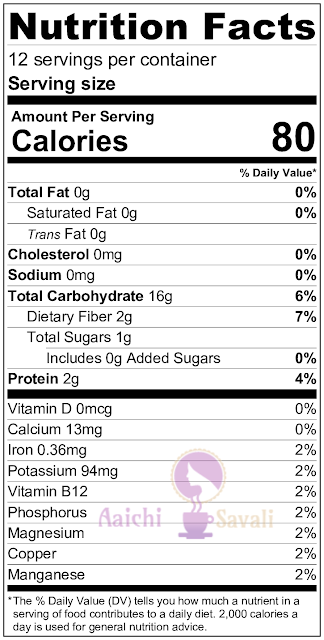 Low GI: The carbohydrate content of barnyard millet is low and slowly digestible, making the barnyard millet a low glycemic index food. Hence, it can be potentially recommended for patients with cardiovascular disease and diabetes mellitus. A 1 serving of upvasachi idli has 80 calories and 2 g of protein and 1 g of dietary fibers. Sago or sabudana is food which is full of energy and carbohydrates. Minerals like calcium, iron and some others are contained by sago which helps in the improvement of joints and bones. Eating for breakfast, lunch and evening snack is good.